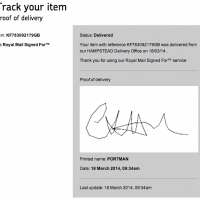 Prices for Royal Mail Signed For™ 1st Class are the same no matter where items are being sent in the UK. The amount customer pay depends on the size and weight of the item being sent. Each format has its own size and weight limits. An Horizon label is an adhesive postage label that is a type of variable value stamp. 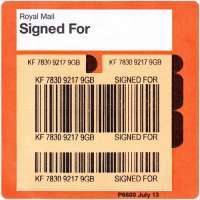 The labels were introduced in the United Kingdom in 2002 as part of the computerisation of the counter services of the post office network of Royal Mail using the Horizon System. 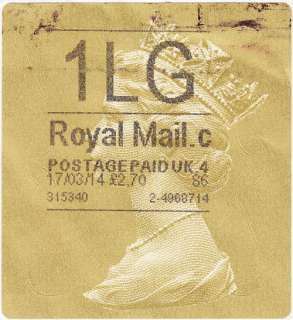 The first labels were large plain labels composed purely of text but later labels are of a gold colour with a Machin head and a repeating pattern of the words ROYALMAIL in order to prevent forgery. Machin Horizon Label is stamp/label that are oversized Machins measuring 59 x 64.5 mm and printed in pale ‘gold’ with full bleed (no white frame around design). It was introduced in June 2009. The Queen’s Head was produced using a wavy line ROYAL MAIL pattern printed in micro text pale ‘gold’. The complete label was overprinted with a repeating iridescent wavy line ROYAL MAILpattern for the background while the head itself had a different pattern. These labels were not printed with phosphor lines and they are self-adhesive paper. Produced by De La Rue and printed in photogravure. Original version has simulated perforation while the revised has ‘straight edged’ and rounded corners. The revised versions were introduced on 23 August 2010 to address problem with operational difficulties by clerk when feeding the second label after the first one has been removed. The printing for different services are produced at the point of sale using ink jet printer and in black. New codes were introduced in April 2013, when Packet (1PK, 2PK) and Standard Parcel (SP) services and indicators were replaced by Small Parcels (1SP, 2SP) and Medium Parcels (1MP, 2MP). Two set of numbers at the bottom are Post Office Branch Identifier on the left and on the right, the transaction number. Transaction number is also recognised as 'Session' printed on receipt upon payment. ‘Accounting codes' are solely for easy identification of the VAT rate or product combination for each label, where a subsequent refund has to be made, ensuring any VAT is accounted for correctly.